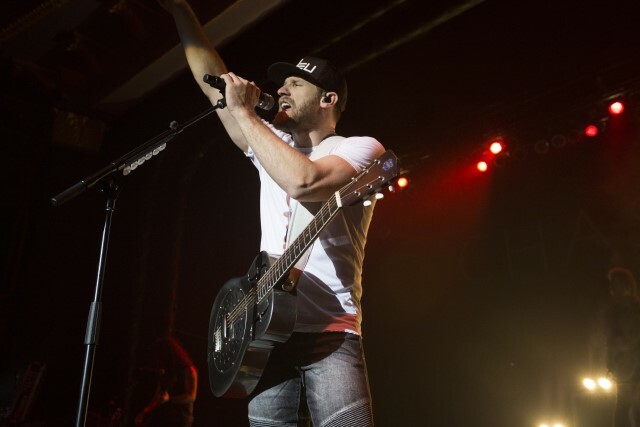 Published Feb. 24, 2019 at 1:01 p.m.
Chase Rice's band members, donned in t-shirts and jean jackets, and all with unique hairstyles, walked on stage at The Rave on Saturday night. The audience could hear Rice singing the first few lyrics of "Lions," but couldn't see him. 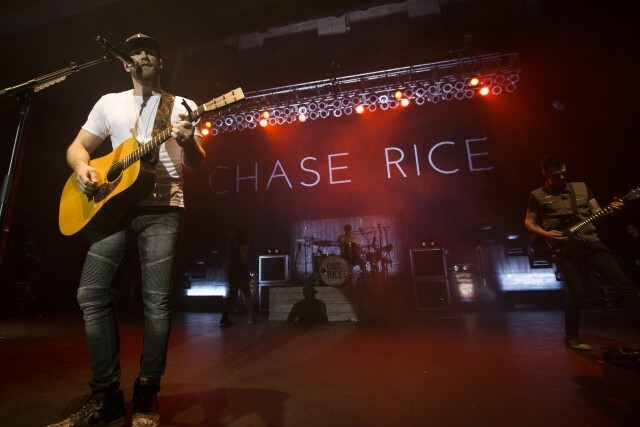 As Rice appeared from stage right, wearing his classic look: a white T-shirt, jeans, a trucker hat on his head and a dog tag around his neck, his high energy for the show was clear. At this concert, I learned a lot about many of Rice's songs, because he explained why he wrote them. I had so much fun hearing Rice's music live, but I think he could've performed more of his own music and fewer covers. During "Do It Like This," the guitarists started a trend that would continue the rest of the show: coming to the front of the stage and jamming out. It helped accentuate the guitarists, who brought plenty of their own energy, and reminded the audience that there is more to the music than just Rice. "How She Rolls" was the first song that really got the audience moving; most people had their hands in the air, but singing participation from the audience didn't really happen until "Everybody We Know Does." This song was released in 2016 and when it first came out, Rice recorded it with some of Nashville's top studio musicians and Rice said the song was based on who they are and what brings them all together. The audience seemed to enjoy this song, but for the meaning behind it or the music, probably the latter. Right before Rice performed "Jack Daniel's Showed Up," he said he had been to The Rave six times now and he has performed at Summerfest. So, it's safe to say he loves visiting Milwaukee. It's great to have him. "On Tonight" was a great song musically, but the audience didn't sing much, so that was kind of a bummer. But, the lack of excitement was made up for when Rice and his band performed "Three Chords & The Truth" because that's when the audience started going wild. Rice explained that he wanted to write something real with this song, and the audience ate it up. Someone raised a flag that looked like it could've also been a scarf. 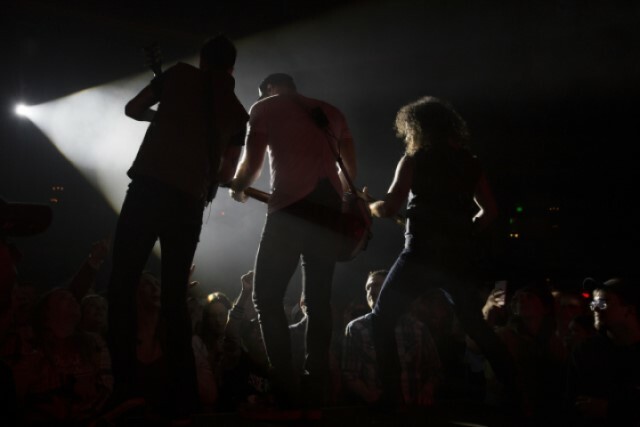 For the next number, "Eyes on You," the country artist said this song, released in 2017, was the first song the band released in three years, and it changed their lives. The band performed it starting just with the keyboardist, and eventually the audience sang along to every word. This song was by far the most energy inducing song at this point of the concert, pushing people to sway their hands side to side in the air. Rice even said, "Milwaukee, you're beautiful." "Carolina Can" was performed by a solo Rice, alone on the stage with a spotlight and his guitar. It was easy to feel the intimacy of the song, and then Rice said the song was written about every small town like the one he grew up in, which added to the intimacy. "Jack Daniels & Jesus," the second song of the night about Jack Daniels, urged audience members to bring out their phone flashlights and sway side to side. The man standing in front of me at the concert even swayed his stack of 10 empty beer cups in the air. The band came back for the next song, "Gonna Wanna Tonight," which was my new favorite song of the night at that point. The guitarists went back to the front of the stage for some more solos, and the audience loved it. But even more fun was had during "Ride," because Rice brought an audience member to the stage: a junior from UW-Madison. Rice asked if the young woman was single, and she said that it doesn't matter, which got some of the audience laughing and the other audience members gasping. Rice described a romantic evening in a hotel room with her, candles and all, and then sang with her the rest of "Ride." The group on stage continued to sing three cover songs, "Cruise," "All the Small Things" and "Sweet Home Alabama." It was fun to hear those tunes, but was a little too much. Then, one of the guitarists played the fight song for UW-Madison, and Rice scolded him by saying he can't disrespect Marquette by being on their home turf and playing that song. A friendly fight broke out among the audience: those supporting UW-Madison threw their hands up in a "W" formation and those supporting Marquette (okay, maybe it was just me and the friend I came to the concert with...) cheered for the golden eagles. I was surprised how against Marquette the majority of the concert goers were. Where are my blue and gold fans?! The group played "Sweet Caroline" and one of the guitarists finished the song by holding his mint colored guitar up in the air — with his mouth! It seemed as though he does that often; there were chew marks on his green guitar. I was amazed at his strong teeth. But someone's gotta get this man some food next time so he's not tempted to snack on his instrument. Rice performed one more cover, "Cruise" for the second time, and then the song the audience had all been waiting for — "Ready Set Roll" — was finally played. The audience got back into the country vibes, and then before we were ready, the concert was over. There was no encore, and instead, Rice walked around signing autographs on random items the audience was waving in his face. After Rice left the stage, his guitarists went around signing items as well, and that's when I caught a guitar pick and got my ticket signed. I also was able to high-five the artists as they walked by, which was the closest I had ever been to famous musical artists. I was happy Rice and the band members got to have this much audience interaction at the end of the show, but I still wish they would've been able to perform at least one more song that was an original to close out the night. Cover songs are fun and get the audience to sing along, but I still would've liked to see tunes such as "Beer with the Boys" and "Beach Town." Overall, it was a great concert and I hope to see Chase Rice back in Milwaukee again soon - perhaps for a Summerfest show, or his seventh trip to the Rave! "Three Chords & The Truth"